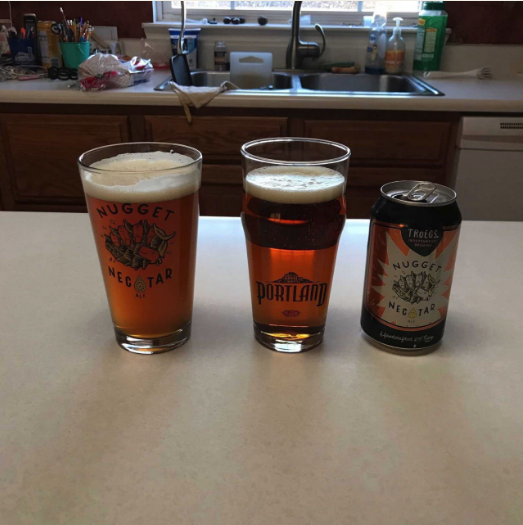 Troegs Nugget Nectar has always been one of my favorite seasonal brews. It's not an IPA. It's an imperial amber. What makes this unusual is that it uses Vienna as the base malt. I had never used Vienna in this large of a quantity before. This brew turned out great. The SRM was spot on. I highly recommend brewing this if you are a hop head! Never had Nugget Nectar that I can recall. Sounds interesting. I've often thought of hopping up my vienna lager. Troegs distributes mostly in the North Eastern US. I've not encountered their beer very often, if at all, any where else. Their brewery, in Hershey, pa, is only about 30 minutes from where I live. Looks like the Round Hill Mini Market just a few minutes of my house has nugget nectar according to the troegs website. I'll have to check. If you can find it, try Troegs Red Elf at Christmas. Had it at a brew fest and can find it once in a while in a local grocery. Do you mean Mad Elf? There is also a Naked Elf with no cherries or honey. I love this beer! I brew up a clone of it every year based on the recipe I found in Craft Beer for the Homebrewer which Denny had a hand in. My keg just kicked on it actually about two weeks ago, always makes me sad when it's gone. Interesting. I had not come across that book in any of my research. I'm going to pick up a copy of that just to check it out. I've not had Naked Elf. But it does give me an idea for something to try. Wild Elf is also delicious for reference. Nugget Nectar is my favorite winter seasonal beer. This year was my fifth batch of the clone as I try to time it close to the end of January/beginning of February so I can do a taste comparison. I kept thinking I'd had something from Troeg's then I remembered it was the troegenator. Wasn't all that fond of it as I recall. Found a sixpack of NN at a local grocery. Just started drinking one. Nice fruity aroma right out of the bottle. Nice looking well crafted beer. Very clear. Decent head retention and lacing. The aroma seemed to dissipate quickly but could be due to my allergies. Nice IPA but a little heavy on the grapefruit, pine and resin for my tastes but still very good. The grain bill certainly has me thinking... Nice and malty without all the caramel sub-taste that's been nagging me in my IPAs of late. @BrewingAroundtheRealm your Nugget addition of 2.2oz for 10 minutes? Whirlpool? Troegenator is definitely an acquired taste. Yes, I did a 2.2 Oz. Nugget addition at 180 degrees for a 10 minute whirlpool. Troegs Is one of my favorite bottles to save for my own refilling. Partly because of their old time font choice on the bottle but mostly because their contents are always good. Definitely agreeing with this article recipe. Troegs is definitely an amazing choice for refilling (192.168.100.1 IP routerlogin). I am new to this forum and have been learning a lot about brewing insights, thank you guys for being so helpful! What was the final conclusion to the "Vienna Malt is just watered down Munich malt" debate? This recipe could just be Vienna Malt depending on whose argument was more convincing.